But there are merging objects far larger whose gravitational wave signals have not yet been detected: supermassive black holes, more than 100 million times more massive than our Sun. Most large galaxies have a central supermassive black hole. When galaxies collide, their central black holes tend to spiral toward each other, releasing gravitational waves in their cosmic dance. Much as a large animal like a lion produces a deeper roar than a tiny mouse's squeak, merging supermassive black holes create lower-frequency gravitational waves than the relatively small black holes LIGO and similar ground-based experiments can detect. "Observing low-frequency gravitational waves would be akin to being able to hear bass singers, not just sopranos," said Joseph Lazio, chief scientist for NASA's Deep Space Network, based at NASA's Jet Propulsion Laboratory, Pasadena, California, and co-author of a new study in Nature Astronomy. To explore this uncharted area of gravitational wave science, researchers look not to human-made machines, but to a natural experiment in the sky called a pulsar timing array. Pulsars are dense remnants of dead stars that regularly emit beams of radio waves, which is why some call them "cosmic lighthouses." Because their rapid pulse of radio emission is so predictable, a large array of well-understood pulsars can be used to measure extremely subtle abnormalities, such as gravitational waves. The North American Nanohertz Observatory for Gravitational Waves (NANOGrav), a Physics Frontier Center of the National Science Foundation, is one of the leading groups of researchers using pulsars to search for gravitational waves. The new Nature Astronomy study concerns supermassive black hole binaries -- systems of two of these cosmic monsters. For the first time, researchers surveyed the local universe for galaxies likely to host these binaries, then predicted which black hole pairs are the likeliest to merge and be detected while doing so. The study also estimates how long it will take to detect one of these mergers. "By expanding our pulsar timing array over the next 10 years or so, there is a high likelihood of detecting gravitational waves from at least one supermassive black hole binary," said Chiara Mingarelli, lead study author, who worked on this research as a Marie Curie postdoctoral fellow at Caltech and JPL, and is now at the Flatiron Institute in New York. While LIGO and similar experiments detect objects in the final seconds before they merge, pulsar timing arrays are sensitive to gravitational wave signals from supermassive black holes that are spiraling toward each other and will not combine for millions of years. That's because galaxies merge hundreds of millions of years before the central black holes they host combine to make one giant supermassive black hole. "A difference between when the pulsar signals should arrive, and when they do arrive, can signal a gravitational wave," Mingarelli said. "And since the pulsars we study are about 3,000 light-years away, they act as a galactic-scale gravitational-wave detector." Because all supermassive black holes are so distant, gravitational waves, which travel at the speed of light, take a long time to arrive at Earth. This study looked at supermassive black holes within about 700 million light-years, meaning waves from a merger between any two of them would take up to that long to be detected here by scientists. By comparison, the oldest animal life on Earth -- algae -- is thought to have arisen about 650 million years ago. 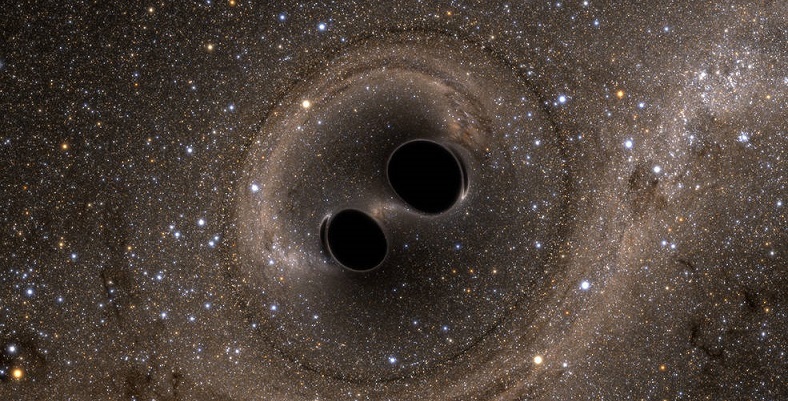 "Detecting gravitational waves from billion-solar-mass black hole mergers will help unlock some of the most persistent puzzles in galaxy formation," said Leonidas Moustakas, a JPL research scientist who wrote an accompanying "News and Views" article in the journal. 2MASS was funded by NASA's Office of Space Science, the National Science Foundation, the U.S. Naval Observatory and the University of Massachusetts. JPL managed the program for NASA's Office of Space Science, Washington. Data was processed at IPAC at Caltech in Pasadena, California. Iz svih dosadasnjih clanaka ove vrste, koji su vezani za pojavu gravitacionih talasa, vidi se da nauka ne poznaje ustrojstvo univerzuma i zato nema jasnu predodzbu formiranja ni materije niti redosljeda formiranja i nastanka nebeskih tijela. Prva cinjenica , koja nauku cini nejakom da sazna istiniti uzrok pojave je, nepoznavanje procesa formiraja materije. Mora se jednom shvatiti i prihvatiti da je univerzum beskonacna sfera i da je popunjena substancom AETHER, od koje se formira materija. Materija se formira u dva vida : "cvrsto" i "tecno" stanje materije , koji svaki od njih ima odredjeni odnos i vezu sa Aetherom od kojeg i formiran taj vid. Tako je odnos Aethera i " cvrstog " stanja nastala pojava -GRAVITACIJA, a odnos Aethra i " tecnog" stanja je MAGNETIZAM. Posto gravitacija ne posjeduje nikakve osobine fizikalne, ne mogu se formirati ni talasi, a sama teorija Ajnstajnova kako se gravitacija javlja kada materija "zaluta" u mrezu gdje su se zapleli prostor i vrijeme , je apsurd iAjnstajnova fatamorgana. Isto je nepoznanica za nauku proces nastanka nebeskih tijela. Crne rupe je proizvela gravitacija da bi se materija vratila i transformisala nazad u vid Aethera iz koga je formirana. Znaci crne rupe su "grobnica " materije i one se formiraju obrnutim redom od onog po kome se formiraju nebeska tijela od Aethera. Crne rupe se ne mogu sudariti, jer oko njih se nalazi na stotine milijardi zvijezda, koje moraju bit "progutane" da se od njih formira aether i da se u univezumu odrzava ravnomjeran odnos materije i Aethera.